The Clay County Sheriff knows it is important for the inmates and their families to maintain personal contact during the period of incarceration. 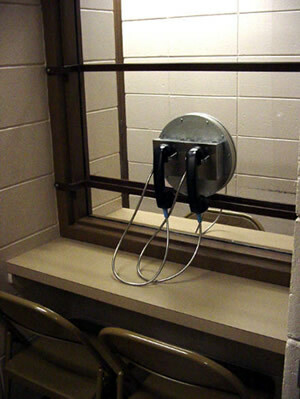 Therefore, the Clay County Jail is equipped with a visitation booth for a secure visit where the visitor is physically separated from the inmates in the jail. For privileged visits such as clergy, attorneys, and family members under special conditions, a secure visitation room inside the jail is available. Visiting Hours: Visits will be allowed from 2:00 PM through 4:00 PM on Sundays, Mondays, and Thursdays, including holidays. The visitor must, on the day of the visit, call or otherwise contact the jail at (605)677-7117 to set an appointed time for the visit during regularly scheduled visiting hours. Appointments shall be on a first come, first serve basis as space provides. Each inmate shall be allowed one 30 minute block of visitation time on each visiting day and may divide that time among as many visitors as he chooses. If any visitors are late for their appointed time, they shall forfeit that portion of the visitation time for which they are late, up to and including the entire 30 minute visitation block. This is to ensure other inmates receive the visitation time they have scheduled. Each inmate may receive a maximum of two visitors at a time, including infants and children. Anyone under the age of 18 must be accompanied by a parent or guardian to visit an inmate. Any exceptions to this must be approved in advance by the sheriff. All visitors must present a photo ID at the time of the visit. A written copy of these instructions is available at the Clay County Jail. Click here to send a tip about any crime to the Sheriff. Your message will remain anonymous.